While sitting by the pool in Mexico last week, I watched an extremely attractive and scantily clad couple swoop in like celebrities making a grand entrance, lapping up admiring stares from the other sunbathers. I know they were enjoying it because they kept looking around to make sure people were noticing them. Not that anyone could possibly ignore their incredibly inappropriate displays of affection at the pool bar. Clearly, they wanted to be seen and might as well have been announcing, “We have arrived!" Trying to hide my interest behind dark glasses and a magazine, I became fascinated with their performance. Who was it for? It made me think of last week’s Are we there yet? question. They certainly thought so. Ironically, shortly before they ‘arrived’ I discovered a different answer to that same question, and it wasn’t the “We’ll get there when we get there” answer I’ve been feeding my children all these years. Coincidentally, that answer pretty much sums up my philosophy on life as well. I’m not always sure where I’m going or how long it will take me to arrive, but I know it when I get there. There are some things you can’t predict or rush – where the journey itself prepares us for our destination. One of those things is life. The answer I mention can be found in SQuire Rushnell’s book Divine Alignment (pg. 166). Rushnell describes the phenomenon of 'arriving' as filling what he calls The Wonderful Well Within. Each of us is born with a Well Within. It was made to store contentment. At birth, like the cellar of a new home, it’s empty. Momentarily. For our desire is to fill it, as quickly and as often as possible. Day in and day out, we subconsciously try to fill the contentment void. We convince ourselves that: If I can just get rich and famous, my Well Within will always be overflowing with contentment. But, honestly, does wealth and fame every really fill the Well Within? The answer is always no. Please listen to me; this is the big answer: THERE IS ONLY ONE WAY FOR YOU TO FILL THE WELL WITHIN. God created you with an empty Well Within for the express purpose of filling it with Himself. True contentment and joy come only when you fill your wonderful Well Within with the love of God. We all experience joy and contentment in this life at different moments to different extents. I couldn’t have been more content at that moment surrounded by unparalleled beauty with someone passing out Klondike’s on a stick. But last year I was just as content sitting in Ghana eating rice for a week. 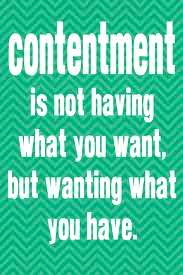 Joy and contentment aren’t determined by your situation. It is something you choose regardless of your location or circumstance. I know people who can be miserable anywhere, and I know miserable people with lots of 'stuff.' I also know joyful people who have nothing. I decided right then that those three words – I have arrived – will be my epitaph because in reality, my life is one long journey towards a destination I will never reach in this world. Everything that happens here is just preparation for that arrival. The earthly joy and contentment I experience is but a foreshadowing of what’s to come because no one can deny there are plenty of situations in this life that can rob us of joy and contentment - if only temporarily. I thought back to that couple’s grandiose arrival. Our entrance wasn’t nearly as flashy. We felt more like the Beverly Hillbillies pulling up to the Ritz with bags overflowing from our small rental car. How much baggage do you need to sit by the pool for a week? A lot less than we thought. Same with life. We can all get by with a lot less baggage, yet we choose to lug it around anyway. That is why I believe that even though joy and contentment are definitely ours for the taking, most of us choose to get bogged down with emotional baggage we don’t need or want until we truly arrive at our final destination where a divine porter will be waiting to gladly take them off our hands for good. And there lies the comfort and the promise of those three words: I HAVE ARRIVED!